As competition intensifies, manufacturing companies operating in different industries are also focusing on incorporating strategies that can lead to cost reduction, capacity expansion, and operational efficiencies – putting pressure on their procurement system to successfully mitigate risks involved in the procurement process. Analyze and eliminate internal risks. Focus on Tier 1 suppliers. Determine different types of procurement risks. Identify macro and micro-economic risks. Interested in analyzing different types of procurement risks influencing the supply chain. Request a free demo below and know how experts can assist you. 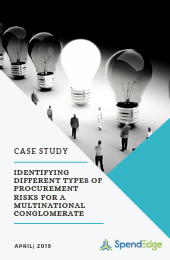 The experts at SpendEdge conducted an in-depth analysis of the procurement process and identified different types of procurement risks pertaining to the conglomerate. They determined the risks that the client may face throughout the procurement cycle that could hinder the efficiency of the procurement cycle. This approach enabled the client to reduce the possibilities for frauds and corruption and detect possible irregularities in advance. Additionally, the analysis of supplier’s financial stability helped them to address different types of procurement risks. Gain a comprehensive overview of the structure and current state of the supply chain. Determine different types of procurement risks associated with the supply chain. Figure out the typical risks associated with the key suppliers and analyze the impact on the business. Devise risk mitigation strategies to impede the possible impacts on the supply chain as a result of the risks. Conduct risk assessment pertaining to demand and supply side. Analysis of different types of procurement risks helped the client to understand the structure of the supply chain. They assisted the client in obtaining appropriate approvals before undertaking projects in different countries and helped them to proactively address compliance risks. SpendEdge analyzed every attribute of the suppliers associated with the client, starting right from the supplier’s financial stability to the level of short and long-term liabilities to eliminate excess costs involved in re-tendering. Managing a procurement process becomes a tedious task and results in monetary losses for the company, if not done rightfully. To know how you can analyze different types of procurement risks, request a free proposal. SpendEdge delivers robust, real-time procurement market intelligence that helps sourcing and procurement professionals to analyze different types of procurement risks. Our innovative procurement solutions help enterprises to transform structural capabilities of businesses and improve execution efficiency. Our state-of-the-art procurement solutions help enterprises to transform the structural capabilities, improve execution efficiency, and achieve better cost savings. We provide businesses with actionable insights and techniques to improve their procurement capabilities. Moreover, our category managers provide the latest industry news, supplier updates, and innovation landscape to help the client address different types of procurement risks. procurement risks and improve their procurement process, request a free proposal below!